Spring is here! And for some farmers, that means it’s maple syrup season. Out in Wisconsin, our partners at Maple Valley Cooperative have begun the process that leads to the sweet nectar we enjoy on our pancakes and in our coffee and baked goods. 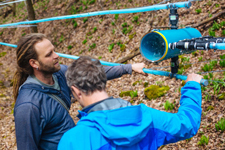 For the co-op’s farmer-owners, the practice of harvesting sap and creating syrup is a way for them to connect to their families and the land as well as customers like us. 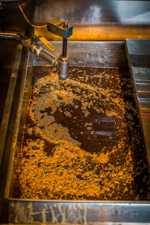 After rendering, the syrup is filtered, cooled and prepared for bottling. It is tested for flavor and graded by color. Amber syrup is lighter, comes earlier in the season, and is popular for baking and as a topping. Dark syrup comes later and is often used to sweeten coffee and as part of the Master Cleanse detox fast. 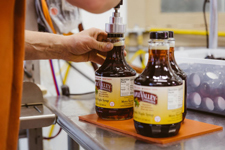 Maple Valley Co-op syrup is all certified organic, which means they abide to strict guidelines about how they harvest the sap and steward the sugarbush. There are rules to encourage tree diversity and limit the number of taps per tree, and farmers must have a plan in place for the regeneration of the forest and the wildlife that lives there. 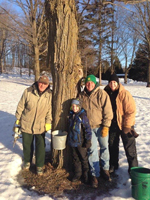 So when enjoying your delicious maple syrup in whatever format you prefer, remember the farmers who tend to the trees and trudge through the snow to bring you some sweetness! For creative ways to use maple syrup in your cooking, check out Maple Valley Co-op’s Recipe of the Week Series.